Is Calling a Gay Candidate 'Weak' a Homophobic Dog Whistle? 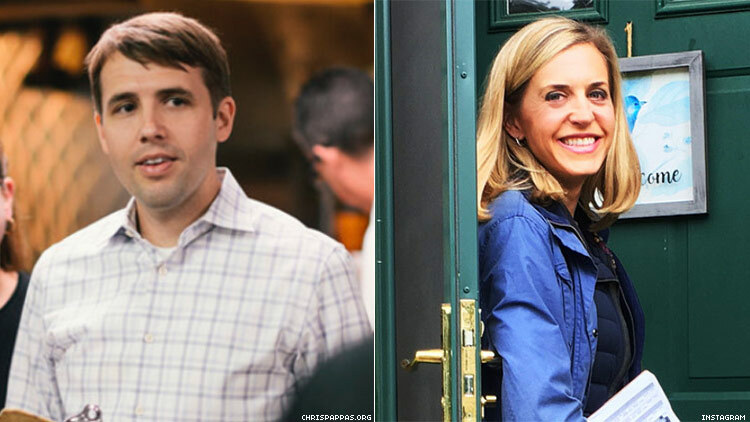 Supporters of Congressional candidate Chris Pappas say fellow Democrat Maura Sullivan was weaponizing homophobia when she implied he's stereotypically weak. A Democratic candidate for Congress from New Hampshire is being accused of making a homophobic “dog whistle” comment against a gay rival. Maura Sullivan, one of 11 candidates seeking the Democratic nomination for U.S. House in New Hampshire’s First District, sent a campaign mailer last week that said opponent Chris Pappas has “no real backbone” and is “not a real progressive,” Manchester TV station WMUR reports. Pappas is gay, and his supporters say the implication that he is weak plays into a homophobic stereotype. “Suggesting that a gay man is weak or spineless is among the nastiest attacks I've seen in any primary and no New Hampshire Democrat, especially those of us who fought for marriage equality, transgender equality, and a conversion therapy ban, should stand for these smears,” State Sen. David Watters told the station. Sullivan’s mailer contended that Pappas is not truly progressive because in 2016 he was endorsed by the National Federation of Independent Business, a conservative group with ties to the Koch brothers, in his run for reelection to the New Hampshire Executive Council, a state administrative body.